Home » Guest post » Writers Come to see Writers. Writers Come to see Writers. I have a lot of HoCoPoLitSo memories. They start from way back when I was in high school and I had no idea the organization existed or what it did. All I remember was that I was on a field trip that left me wanting to be Derek Walcott once I grew up. Though a favorite HoCoPoLitSo memory, that is another story. Today I want to share a few moments of writers coming to see writers and what an honor it is to be in the midst of such occasion. Many stories start with Irish Evening for HoCoPoLitSo. It is a landmark event. I think my awareness of other writers coming to HoCoPoLitSo events to see our headliner started one such evening. Maybe it was the Guinness, but more probably it was Colm Tóibín that brought Colum McCann down to our neck of the woods from his Manhattan apartment for the 21st annual Irish Evening. At that point in the now world famous career of Tóibín, it was a rare thing to him to this side of the Atlantic. McCann took advantage and a train to visit Columbia a year after he himself had read for Irish Evening. I remember little of the reading that night. I seldom remember Irish Evenings and that is not for the drinking that often followed. They are labor intensive occasions to produce and I tend to be tending to that aspect. Tóibín’s voice is still in my head and bits of The Heather Blazing from that reading; I did catch some of it. What I do remember is that there were a handful of folks, me lucky enough to be among them, that headed off into the night with a number of bottles to listen to Colm and Colum talk about writing once the event was done and packed away. What an honor. Quite recently, Colum McCann, now many books into his fame, came to another Irish Evening to read from Transatlantic, just about to be published. It was his first reading of the work to an audience and a fascinating occasion as he caught a sentence he hadn’t right and promised us he would go back to the galleys to correct it. An honest moment in the creative process. I spotted a number of Howard County writers in attendance that evening. They were joined by none other than Alice McDermott and, I am told, George Pelicanos. The two had come from Baltimore and Washington, respectively, to take in one of the masters of prose in suburban Columbia. If we are dropping names here, I’ll add that the Governor came from Annapolis and even joined in to play with the band. After the evening at the green room party, McCann himself joined in the singing of songs. 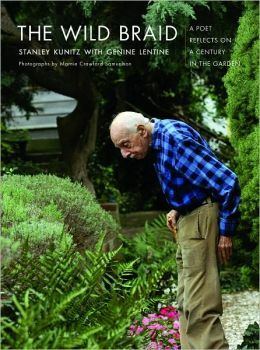 Stanley Kunitz in his garden on the cover of his book The Wild Braid. Perhaps my favorite coming together of writers to see a particularly treasured writer was for the poet Stanley Kunitz in 1993. We all knew Mr. Kunitz was old old, 88, and that this would be the last opportunity we would have to see him. In a space that no longer exists as a venue for readings – the lower Nursing Lounge on the campus of Howard Community College – Kunitz read to a standing room only crowd that adored each and every syllable. The audience well knew his work and you could tell that he could tell: he put on a commanding performance. I remember crowded in that room with us were Carolyn Forché and Gregory Orr who had come up from the University of Virginia for the occasion. Afterwards at a reception, all whispered to each other in awe and confirmed how lucky we were to have shared this intimate occasion with the great Stanley Kunitz. I went on to hear him read a number of times since that occasion: our collective luck grew as he lived to be 100. Why do writers come to see other writers? For the occasion of Kunitz, it was likely reverence and the notion of ‘this might be the last time’ and one not to miss. On other occasions, it is probably more outright a taking in of craft, an opportunity to learn and admire. I know I go see other writers to learn and affirm what common language can do in the hands of masters. Thank you for that, HoCoPoLitSo. Have a favorite HoCoPoLitSo memory? HoCoPoLitSo is currently celebrating its 4oth season and would love to hear from you. Visit the Share Your Memory page and share a favorite story or two with us. As we collect favorite memories, we’ll share them in a future blog posts. By hocopolitso in Guest post on February 19, 2015 .